I figured I'd post pictures of the enclosure I designed. It's based on 1/4'' plexiglass, held together by 3D printed brackets. 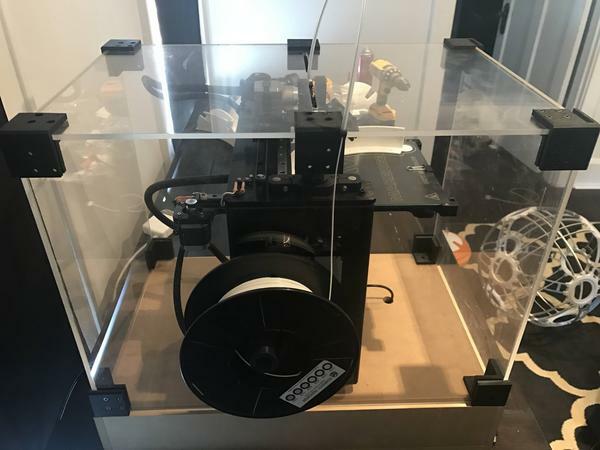 The spool is mounted on the outside of the box to keep it small and a routed slot is cut in the top to feed the filament in. The front panel slides up giving generous access to the printer and interior of the enclosure. 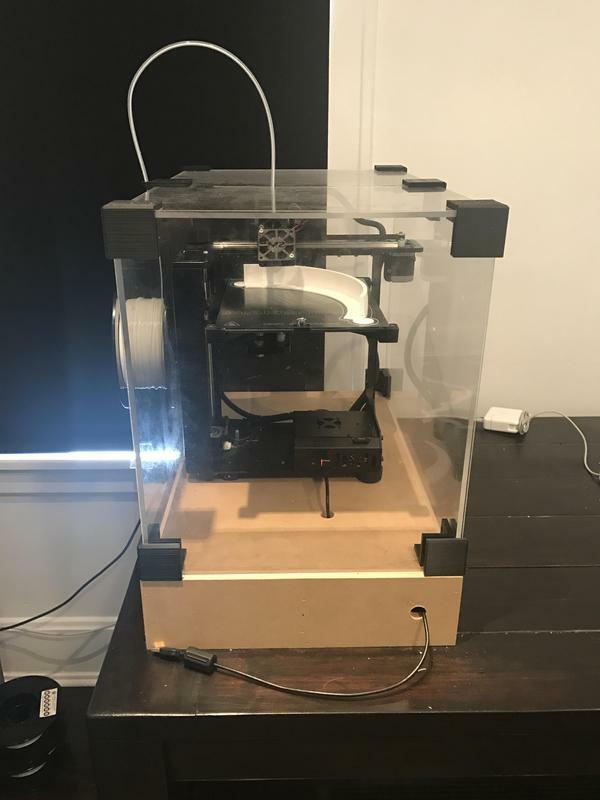 The enclosure itself is pretty much as small as it can be and still give the printer enough room to move. 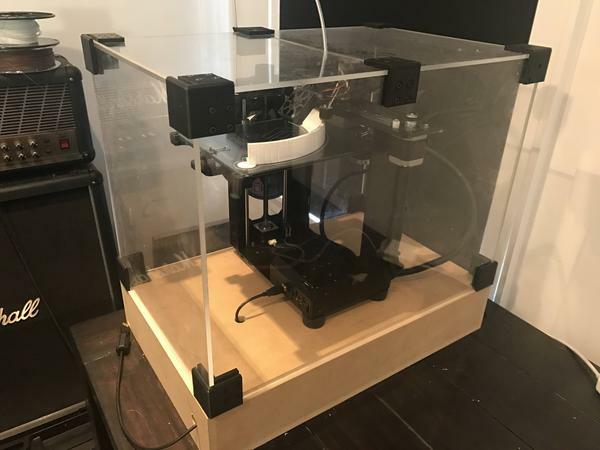 The power supply is stored in a wooden box underneath the printer platform and holes are drilled in that wooden box to feed the necessary cables where they need to go. The only downside, and it's a small one, is that it needs to be unplugged from the wall to turn it off. This is because the printer needs to be taken out to remove lid to the wooden box and access the power supply. But that's a small trade off for hiding that ugly power supply. If anyone is interested in building one, I can send the CAD files. It's build like a tank and really helps to keep the noise down and heat in (if you need that sort of thing). Very nice! Love the small footprint! Yeah, it looks big, but there's really no wiggle room left in there. Probably less than a quarter inch in all directions. That is a very nice enclosure and especially the connectors. I like how you've set it up for a sliding panel. Have you found that the single slider is sufficient for ordinary access to the M2? What do you do when you need more access? With the bed all the way down, I find that it's more than enough access to do whatever I need to do with it. Honestly, I never have to take it off. I take out the glass plate each time I remove a print, and there's plenty of room to do that comfortably. 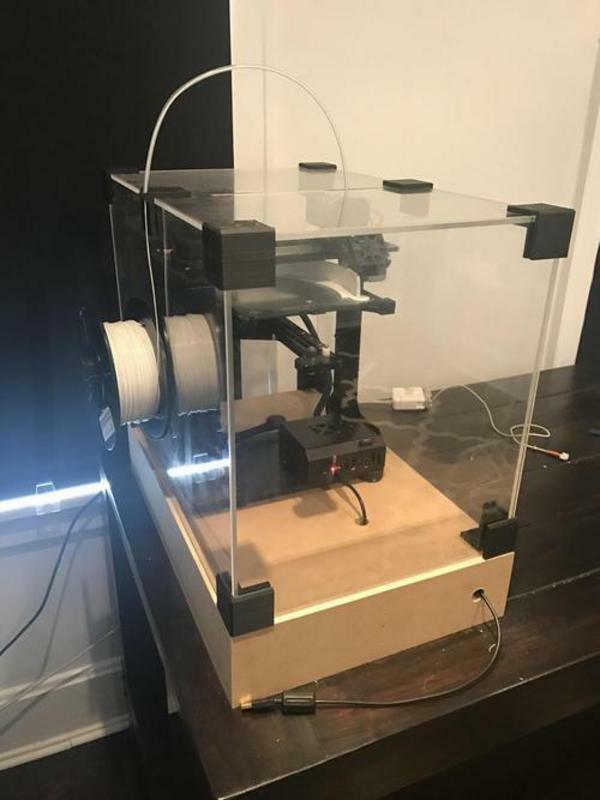 The only time I take it off is if I'm printing something where I want extra cooling and don't want to worry about the enclosure getting too hot on the inside. But even then, I'm not sure I need to remove more than the front panel. Well it's just plain superb. It would be wonderful if you could share your design. Thank you. I designed it in Solidworks, so I just need to figure out the best way to put the design out there because I'm sure most people don't have access to it. 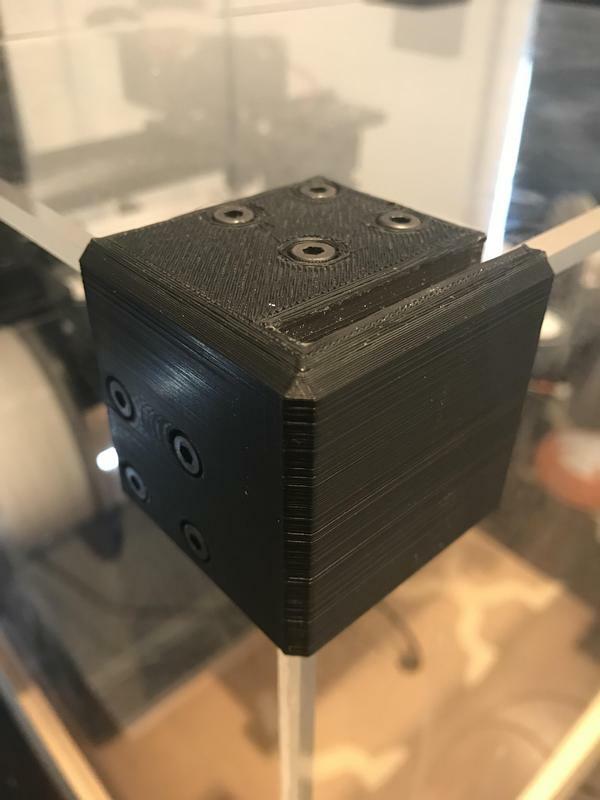 how about stl files for the connectors and overall dimensions for the box itself? I think most of us can fake it from there. the magic is seeing it done. I know I'm very late posting to this thread but I just came across your enclosure design and I love how simple and effective it is. Could you post the Solidworks files of this design and the corner brackets/connectors? Thanks.